Maryland’s Eastern Shore stretches from Kent Island all the way to Ocean City. It is known for its still largely untouched land encompassing everything from lovely waterfront areas to farm land to historic towns. Queen Anne’s County is known as the gateway to the Eastern Shore and it is the first area you will come to as you cross the Chesapeake Bay Bridge. 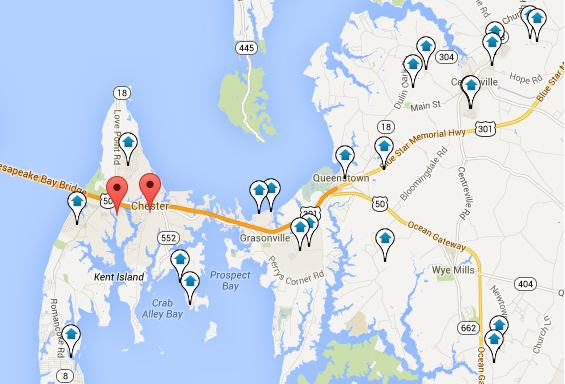 Real Estate on Maryland’s Eastern Shore is very diverse. The area is still very rural compared to most areas of Maryland. It includes the towns of Stevensville, Chester, Grasonville, Queenstown and Centreville to name a few. Here you will find waterfront dining, shopping, antique stores, marinas and golf. There are homes to meet any buyer’s needs. The area offers condos on the water and in water access neighborhoods, small starter homes, mid range homes and luxurious waterfront estates. When considering a move to the Eastern Shore, Queen Anne’s County is definitely worth considering as it offers the closest and easiest commute to Washington, DC, Baltimore, and Annapolis.